A new Sony smartphone has been spotted in a benchmark database. 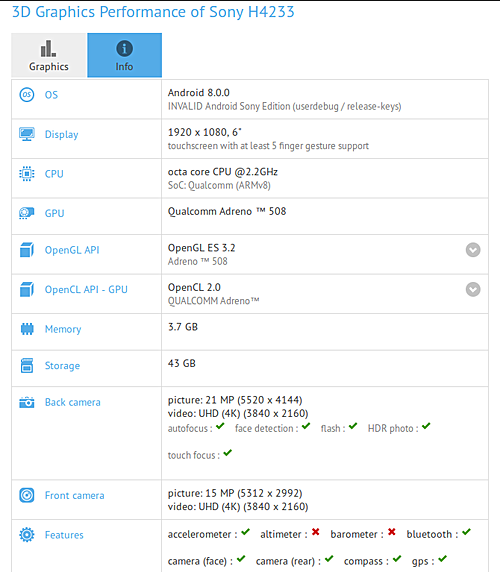 Listed as Sony H4233 on GFXBench, the device is powered by a Snapdragon SoC with octa-core, 2.2GHz processor, and sports a 6-inch display with 1920 x 1080 pixel resolution. RAM is 4GB, while internal memory should be 64GB. The handset features a 21MP rear camera and a 15MP front shooter. It runs the latest Android OS - Oreo, version 8.0. There's currently no information on what the retail name of the device will be or when it might be announced.